The Japan Atomic Power Company's Tokai gas-cooled reactor (magnox, 166 MW), located about 120km north east of Tokyo in Tokai Village, Ibaraki Prefecture is currently being dismantled. From the time it commenced commercial operations in July 1966, until it was shut down in March 1998 it operated for 215,320 hours and produced over 29 million MWh of electricity. It was operational for 77.5% of the time and had a capacity factor of 62%. During 31 years and 8 months of operation there were 61 officially acknowledged accidents and the reactor was down for a total of seven years. Based on these figures, it became old and unprofitable in a mere 25 years of operation. The reasons for the decision to close the reactor were economic - cost of replacing parts, escalating costs of maintenance and so on - but the company refuses to acknowledge that aging was a factor. Other than Tokai, there are 37 gas-cooled reactors (GCR) worldwide. Twenty-four are no longer operating: eight in France, one in Spain, one in Italy and fourteen in England (as at the end of 2003). Of these, none has yet been dismantled, not even those which have been closed for more than twenty years. Tokai is the only one which is being dismantled, so it might be looked upon as a test case for other GCRs. From the beginning we have publicly opposed the dismantling and removal of the reactor, on the grounds that this is both dangerous and expensive. At every opportunity we have demanded, and we continue to demand, that instead, the Tokai reactor should be sealed and monitored for the long term. The program for dismantling the Tokai reactor is a long-term one, broken into four phases: phase one from 2001-2005, phase two from 2006-2010, phase three from 2010 to 2016 and finally, from 2015 to 2017, the building will be dismantled. Currently they are still in the first phase, removing instruments from within the turbine building. Over this extended period it is predicted that several thousand workers will be involved in the dismantling work, so worker radiation exposure will be a serious problem. The company has released no details about worker exposure. Most of the workers live in the surrounding area. 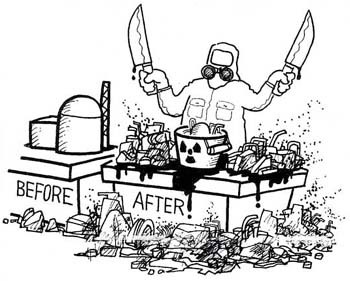 Another big problem is the waste generated by dismantling the reactor. The total quantity of waste will be 180,000 tons, of which 18,000 tons will be radioactive waste. The theory is that eventually the radioactive waste will be buried, but there is no detailed plan for this and the question of where it will be buried has not been decided. Also the distinction between radioactive waste and general waste is vague. Waste which is really radioactive waste will be given a clearance and disposed of as industrial waste. The intention is to either bury this vast quantity of waste, or use it to pave roads. Metals will be reused. It is possible that before we know it, low level radioactive waste will have crept into our daily lives. Another problem is the cost of dismantling the plant. Costs are estimated at 6.7 billion yen for phase one, 8 billion yen for phase two, 78 billion yen for phase three, for a total of 92.7 billion yen. That is two to three times the cost of the construction, but it doesn't include the cost of disposing of the radioactive waste, nor the cost of dealing with worker exposure and covering health costs. Funds have been reserved for dismantling, but the accumulated amount is only 51.9 billion yen. No decision has been made about how to make up the difference. They have in mind building two 1,350 MW next generation reactors on the site of the dismantled reactor. At a time when nuclear power is in decline, they think they can go against the trend. It just shows how out of touch they are. At the same time as all this is happening, a struggle is going on between the village, the company and the local people over the fate of the site of the 1999 criticality accident at the JCO uranium processing plant (see NIT 97, 102). We have supported calls from residents who don't want the accident to be forgotten and who want to preserve the site so that it can act as a warning in regard to nuclear development. Opinion is divided between those residents who support preservation and those who want the plant to be dismantled. Some people waver when the benefits of nuclear energy are expounded. Also, for many people, although five years have elapsed since the accident, at the bottom of their hearts the vivid memory of that fear remains. Some even say, "I feel sick every time I go past that building." But these villagers have solemnly stated that they want the site preserved and the documents and data to be put on display. Prioritizing factors, the government and the nuclear industry jumped for nuclear energy and uncritically promoted development. As a consequence, the environment has been contaminated and people have lost their lives. Now, when they choose a site to dispose of their radioactive waste, they will impact upon people far away from nuclear power plants. The management of radioactive waste will be foisted onto the next generation. So as a caution against this too, the Tokai reactor must not be dismantled and removed. Along with the JCO plant, it must be preserved.